It’s pretty easy to understand why ice dams form. Heated air leaks into the attic, and causes roof snow to melt. Water runs down the roof (or roof valley) until it reaches a cold stretch (typically over an eave) and where it freezes. A ridge of ice builds up and forms a dam. Water backs up, seeps under shingles, and follows nail holes through the roof deck and into your home. What’s not so clear is why ice dams form after some snowfalls and not others, and what to do about them. Shedding some light on the first question is Steve Kuhl, owner of The Ice Dam Co. in Hopkins, Minn. His crews removed nearly 300 ice dams last winter, so he knows something about the subject. He suggests that moderate to heavy snow followed by daytime temperatures of 15° to 25° F has high potential for generating ice dams. Lower temperatures make it less likely that roof snow will melt. Higher temperatures make it less likely ice will build up and form a dam. So when there’s snow on the roof and the temperature is in this range, get out your snow rake! 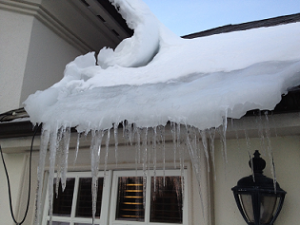 You can read Kuhl’s excellent article, “Making a Business of Ice Dams,” in JLC magazine. The what-to-do question, is really a two-parter. First, what do you do if you have an ice dam right now? The second is what to do to prevent ice dams from reoccurring. 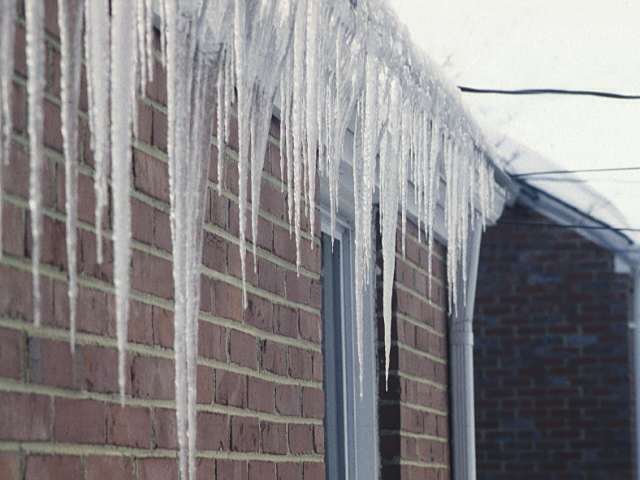 Ice dams are not caused by ice-filled gutters (the real reason is heat loss from the attic), but gutters can be damaged by the heavy ice buildup. If you’re experiencing in-flowing water from an ice dam, contain the leak with basins and towels. If water is pooling above the ceiling, puncture the drywall to allow it to drain into a container. Keeping the water flowing may allow you to keep repairs to patching and painting once everything dries out. Next, introduce cold outside air to your attic by opening vents and windows. Use a fan to disperse it throughout the attic. If the air is cold enough, it will allow water on the roof to refreeze. If insulation is blocking your soffit vents, pull it way and make a mental note to install baffles after the crisis has passed and before reinstalling the insulation. In addition, lower the thermostat inside your home to 50° F., as long as you can do it without endangering anyone in your household. Close the attic hatchway as tightly as possible, and seal around its perimeter with foam tape. Outside, use a snow rake or stiff broom to remove as much of the snow from the roof as possible. Do not, however, attempt to pull the ice dam off the roof or to break it up with a hammer and chisel. The ice is firmly bonded to your shingles, which will be damaged if you try to pry off the ice. You’d be wise to call an experienced (and insured and licensed) pro in for this task, especially if it’s necessary to climb on the roof. Most pros avoid the use of salts, including sodium chloride (rock salt), calcium chloride and magnesium chloride. They may damage shingles and nearby concrete, are corrosive to metal flashing and gutters, and cannot melt ice quickly enough to be effective. Some pros are equipped to remove ice dams with steam. They cut blocks of ice and toss them carefully off the roof. Steve Kuhl prefers this approach but says it takes experience to keep expensive commercial steamers running in cold weather. If you can keep your attic cold, the snow on the roof won’t melt – at least not until outdoor temperatures rise enough to reduce the likelihood of ice dams. Three ways to a cold attic include air sealing, adding insulation, and improving ventilation. Air sealing keeps warm air from inside your home from rising into the attic. There are dozens of ways it can get there, including attic doors and hatches, AC and heat registers, air ducts, light fixtures, ceiling fans, and bath and kitchen fan vents. Even joints between walls and ceilings may allow warm air to leak to the attic. On a recent ice dam inspection, energy-conservation expert Larry Janesky, said, “I felt like Superman because I could “see” three can lights through 6 inches of snow and roof.” The heat from the lights had created three telltale melt holes in the snow. “By air sealing and insulating, we can fix ice damming,” he says. Sealing these leaks are best done by certified professionals using foam sealants, caulk, can light covers, and attic hatchway covers. Energy conservation companies, such the national network of Dr. Energy Saver contractors, perform air-sealing services. Installing attic insulation or adding to the insulation you have will reduce conductive heat loss from your home to the attic. Avoid blocking the air space between the attic and soffit vents by installing a soffit dam and rafter baffle at the base of each rafter bay. The former prevents loose-fill insulation from spilling over the soffit vent and blocking it. The latter ensures air flow from the soffit to the rest of the attic. If you have gable vents or attic windows, open them. When it’s time to reroof your home, be sure to install ridge vents if you don’t already have them. Make sure your soffit vents are adequate as well. In addition, use a self-adhering roof underlayment, such as Ice and Water Shield, along the eaves and valleys. It provides extra protection should an ice dam manage to develop despite your best efforts. These membranes self-seal around fasteners and are especially worthwhile on vulnerable roofs, such as those over cathedral ceilings and roofs with low pitches. Great advice. Couldn’t agree more with *not* attempting to smash the ice off the roof – as so many seem to do each winter! I’ve seen an awful lot of damage done to roof tiles in this way over the years – which has resulted in some unpleasant damage and expensive water damage to the ceiling cavity on a few occasions.